The S52B32 is based on the M52B28 engine. This engine was designed specifically for the North American M-version models instead of the S50B32 engine used in the European market. The engine got cast iron cylinder block (the same design as the M52B28 has in North America) with 86.4 mm bore. It has a strong and lightweight forged crankshaft able to handle increased loads. Connecting rods saved the length of 135 mm long, but and the piston compression height is 31 mm. The stroke of the crankshaft was increased up to 89.6 mm giving a 10.5:1 compression ratio and 3.2-liter displacement. The S52 engine uses a redesigned M52 cylinder head with Double VANOS system. It has enlarged water channels for better cooling, stiffer valve springs, and new camshafts. The head gasket is unique for this engine and not interchangeable with M52 engines. S52B32 camshaft specs: duration 252/244 deg, valve lift 10.2/10.2 mm. The intake includes a simple plastic intake manifold and electronic throttle body, but the exhaust system got new more efficient exhaust manifold. The engine control unit (ECU) is Siemens MS41.1. Some European car enthusiasts buy S52 engines from the USA due to its higher reliability and tuning potential. 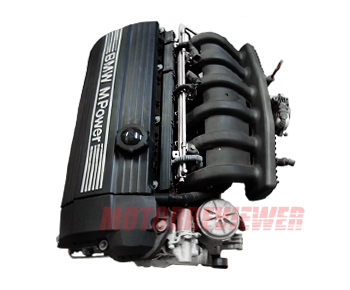 This engine can be found under a hood of the US/Canada BMW M3 E36 or Z3M cars until 2000. In 2000, it was replaced by the real M-engine - S54B32. 1. The thin walls of the plastic thermostat are the common reason for coolant leaks. 2. The increased cooling channel in the head also increases a chance to get coolant in the cylinder when the engine is overheating. 3. High oil consumption can lead to severe damage of pistons under a high load. 4. Double VANOS life is only about 120,000 miles. 5. Air leaks in the intake manifold cause a wrong measurement of the Lambda sensor. That is very common for the S52 engine.